What Is Free Banking All About? I notice that there has been a bit of a dustup lately about free banking, triggered by two posts by Izabella Kaminska, first on FTAlphaville followed by another on her own blog. I don’t want to get too deeply into the specifics of Kaminska’s posts, save to correct a couple of factual misstatements and conceptual misunderstandings (see below). At any rate, George Selgin has a detailed reply to Kaminska’s errors with which I mostly agree, and Scott Sumner has scolded her for not distinguishing between sensible free bankers, e.g., Larry White, George Selgin, Kevin Dowd, and Bill Woolsey, and the anti-Fed, gold-bug nutcases who, following in the footsteps of Ron Paul, have adopted free banking as a slogan with which to pursue their anti-Fed crusade. Now it just so happens that, as some readers may know, I wrote a book about free banking, which I began writing almost 30 years ago. The point of the book was not to call for a revolutionary change in our monetary system, but to show that financial innovations and market forces were causing our modern monetary system to evolve into something like the theoretical model of a free banking system that had been worked out in a general sort of way by some classical monetary theorists, starting with Adam Smith, who believed that a system of private banks operating under a gold standard would supply as much money as, but no more money than, the public wanted to hold. In other words, the quantity of money produced by a system of competing banks, operating under convertibility, could be left to take care of itself, with no centralized quantitative control over either the quantity of bank liabilities or the amount of reserves held by the banking system. [M]y thing against free banking is that we actually already have it. We already have private banks issuing their own monies directly used for transactions – they are called bank accounts and debit/credit cards. There are countries like Sweden where there are now shops that do not accept physical cash (only bank monies) – a policy actively promoted government, if you can believe it. There are now even financial products like Xapo Debit Card that automatically converts all payments received on your account into non-monetary assets (with Xapo it is bitcoins) and back into monies when you use the card for payment. There is a very healthy international bank money market so no matter what money you personally use, you can travel all around the world and pay comfortably without ever seeing or touching official local government currency. In opposition to the Smithian school of thought, there was the view of Smith’s close friend David Hume, who famously articulated what became known as the Price-Specie-Flow Mechanism, a mechanism that Smith wisely omitted from his discussion of international monetary adjustment in the Wealth of Nations, despite having relied on PSFM with due acknowledgment of Hume, in his Lectures on Jurisprudence. In contrast to Smith’s belief that there is a market mechanism limiting the competitive issue of convertible bank liabilities (notes and deposits) to the amount demanded by the public, Hume argued that banks were inherently predisposed to overissue their liabilities, the liabilities being issuable at almost no cost, so that private banks, seeking to profit from the divergence between the face value of their liabilities and the cost of issuing them, were veritable engines of inflation. These two opposing views of banks later morphed into what became known almost 70 years later as the Banking and Currency Schools. Taking the Humean position, the Currency School argued that without quantitative control over the quantity of banknotes issued, the banking system would inevitably issue an excess of banknotes, causing overtrading, speculation, inflation, a drain on the gold reserves of the banking system, culminating in financial crises. To prevent recurring financial crises, the Currency School proposed a legal limit on the total quantity of banknotes beyond which limit, additional banknotes could be only be issued (by the Bank of England) in exchange for an equivalent amount of gold at the legal gold parity. Taking the Smithian position, the Banking School argued that there were market mechanisms by which any excess liabilities created by the banking system would automatically be returned to the banking system — the law of reflux. Thus, as long as convertibility obtained (i.e., the bank notes were exchangeable for gold at the legal gold parity), any overissue would be self-correcting, so that a legal limit on the quantity of banknotes was, at best, superfluous, and, at worst, would itself trigger a financial crisis. As it turned out, the legal limit on the quantity of banknotes proposed by the Currency School was enacted in the Bank Charter Act of 1844, and, just as the Banking School predicted, led to a financial crisis in 1847, when, as soon as the total quantity of banknotes approached the legal limit, a sudden precautionary demand for banknotes led to a financial panic that was subdued only after the government announced that the Bank of England would incur no legal liability for issuing banknotes beyond the legal limit. Similar financial panics ensued in 1857 and 1866, and they were also subdued by suspending the relevant statutory limits on the quantity of banknotes. There were no further financial crises in Great Britain in the nineteenth century (except possibly for a minicrisis in 1890), because bank deposits increasingly displaced banknotes as the preferred medium of exchange, the quantity of bank deposits being subject to no statutory limit, and because the market anticipated that, in a crisis, the statutory limit on the quantity of banknotes would be suspended, so that a sudden precautionary demand for banknotes never materialized in the first place. But with great money-issuance power comes great responsibility, and more specifically the great temptation to abuse that power via the means of imprudent money-printing. This fate befell the BoE — as it does most banks — not helped by the fact that the BoE still had to compete with a whole bunch of private banks who were just as keen as it to issue money to an equally imprudent degree. And so it was that by the 1840s — and a number of Napoleonic Wars later — a terrible inflation had begun to grip the land. So Kaminska seems to have fallen for the Humean notion that banks are inherently predisposed to overissue and, without some quantitative restraint on their issue of liabilities, are engines of inflation. But, as the law of reflux teaches us, this is not true, especially when banks, as they inevitably must, make their liabilities convertible on demand into some outside asset whose supply is not under their control. After 1821, the gold standard having been officially restored in England, the outside asset was gold. 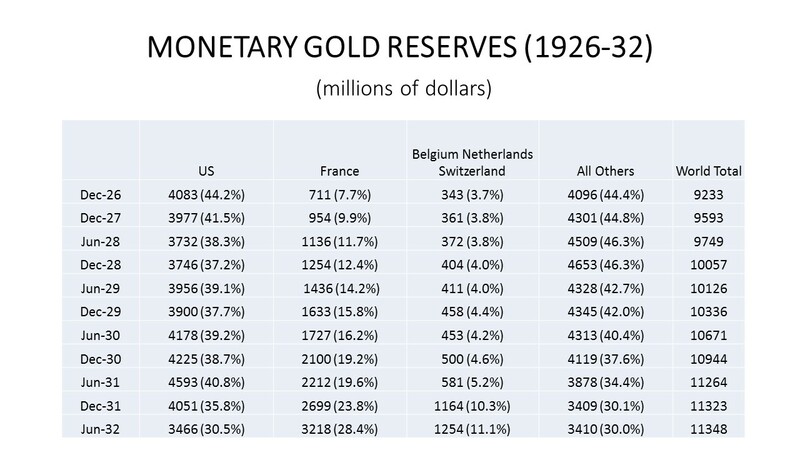 So what was happening to the British price level after 1821 was determined not by the actions of the banking system (at least to a first approximation), but by the value of gold which was determined internationally. That’s the conceptual misunderstanding that I want to correct. Now for the factual misunderstanding. 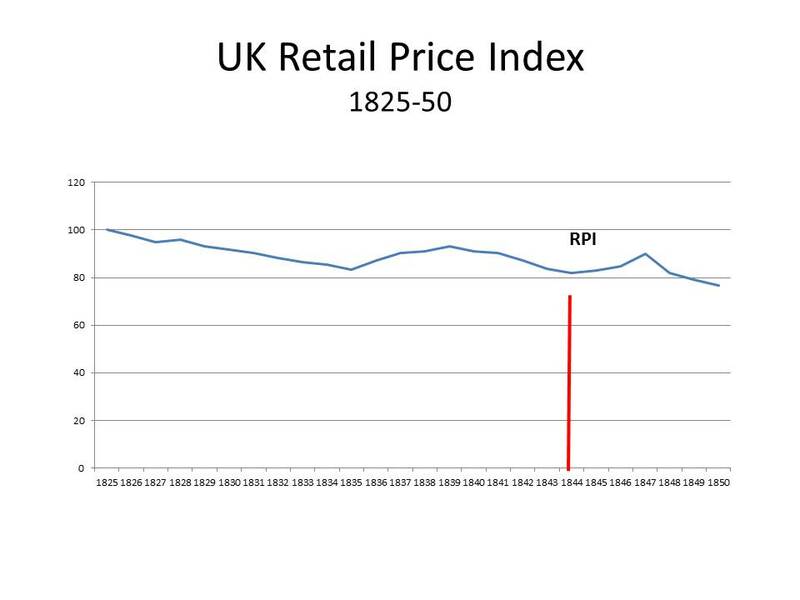 The chart below shows the British Retail Price Index between 1825 and 1850. The British price level was clearly falling for most of the period. After falling steadily from 1825 to about 1835, the price level rebounded till 1839, but it prices again started to fall reaching a low point in 1844, before starting another brief rebound and rising sharply in 1847 until the panic when prices again started falling rapidly. When I set out to write my book on free banking, my intention was to clear up the historical misunderstandings, largely attributable to David Hume, surrounding the operation of the gold standard and the behavior of competitive banks. In contrast to the Humean view that banks are inherently inflationary — a view endorsed by quantity theorists of all stripes and enshrined in the money-multiplier analysis found in every economics textbook — that the price level would go to infinity if banks were not constrained by a legal reserve requirement on their creation of liabilities, there was an alternative view that the creation of liabilities by the banking system is characterized by the same sort of revenue and cost considerations governing other profit-making enterprises, and that the equilibrium of a private banking system is not that value of money is driven down to zero, as Milton Friedman, for example, claimed in his Program for Monetary Stability. The modern discovery (or rediscovery) that banks are not inherently disposed to debase their liabilities was made by James Tobin in his classic paper “Commercial Banks and Creators of Money.” Tobin’s analysis was extended by others (notably Ben Klein, Earl Thompson, and Fischer Black) to show that the standard arguments for imposing quantitative limits on the creation of bank liabilities were unfounded, because, even with no legal constraints, there are economic forces limiting their creation of liabilities. A few years after these contributions, F. A. Hayek also figured out that there are competitive forces constraining the creation of liabilities by the banking system. He further developed the idea in a short book Denationalization of Money which did much to raise the profile of the idea of free banking, at least in some circles. If there is an economic constraint on the creation of bank liabilities, and if, accordingly, the creation of bank liabilities was responsive to the demands of individuals to hold those liabilities, the Friedman/Monetarist idea that the goal of monetary policy should be to manage the total quantity of bank liabilities so that it would grow continuously at a fixed rate was really dumb. It was tried unsuccessfully by Paul Volcker in the early 1980s, in his struggle to bring inflation under control. It failed for precisely the reason that the Bank Charter Act had to be suspended periodically in the nineteenth century: the quantitative limit on the growth of the money supply itself triggered a precautionary demand to hold money that led to a financial crisis. In order to avoid a financial crisis, the Volcker Fed constantly allowed the monetary aggregates to exceed their growth targets, but until Volcker announced in the summer of 1982 that the Fed would stop paying attention to the aggregates, the economy was teetering on the verge of a financial crisis, undergoing the deepest recession since the Great Depression. After the threat of a Friedman/Monetarist financial crisis was lifted, the US economy almost immediately began one of the fastest expansions of the post-war period. Nevertheless, for years afterwards, Friedman and his fellow Monetarists kept warning that rapid growth of the monetary aggregates meant that the double-digit inflation of the late 1970s and early 1980s would soon return. So one of my aims in my book was to use free-banking theory – the idea that there are economic forces constraining the issue of bank liabilities and that banks are not inherently engines of inflation – to refute the Monetarist notion that the key to economic stability is to make the money stock grow at a constant 3% annual rate of growth. Another goal was to explain that competitive banks necessarily have to select some outside asset into which to make their liabilities convertible. Otherwise those liabilities would have no value, or at least so I argued, and still believe. The existence of what we now call network effects forces banks to converge on whatever assets are already serving as money in whatever geographic location they are trying to draw customers from. Thus, free banking is entirely consistent with an already existing fiat currency, so that there is no necessary link between free banking and a gold (or other commodity) standard. Moreover, if free banking were adopted without abolishing existing fiat currencies and legal tender laws, there is almost no chance that, as Hayek argued, new privately established monetary units would arise to displace the existing fiat currencies. My final goal was to suggest a new way of conducting monetary policy that would enhance the stability of a free banking system, proposing a monetary regime that would ensure the optimum behavior of prices over time. When I wrote the book, I had been convinced by Earl Thompson that the optimum behavior of the price level over time would be achieved if an index of nominal wages was stabilized. He proposed accomplishing this objective by way of indirect convertibility of the dollar into an index of nominal wages by way of a modified form of Irving Fisher’s compensated dollar plan. I won’t discuss how or why that goal could be achieved, but I am no longer convinced of the optimality of stabilizing an index of nominal wages. So I am now more inclined toward nominal GDP level targeting as a monetary policy regime than the system I proposed in my book. But let me come back to the point that I think J. V. Dubois was getting at in his comment. Historically, idea of free banking meant that private banks should be allowed to issue bank notes of their own (with the issuing bank clearly identified) without unreasonable regulations, restrictions or burdens not generally applied to other institutions. During the period when private banknotes were widely circulating, banknotes were a more prevalent form of money than bank deposits. So in the 21st century, the right of banks to issue hand to hand circulating banknotes is hardly a crucial issue for monetary policy. What really matters is the overall legal and regulatory framework under which banks operate. The term “free banking” does very little to shed light on most of these issues. For example, what kind of functions should banks perform? Should commercial banks also engage in investment banking? Should commercial bank liabilities be ensured by the government, and if so under what terms, and up to what limits? There are just a couple of issues; there are many others. And they aren’t necessarily easily resolved by invoking the free-banking slogan. When I was writing, I meant by “free banking” a system in which the market determined the total quantity of bank liabilities. I am still willing to use “free banking” in that sense, but there are all kinds of issues concerning the asset side of bank balance sheets that also need to be addressed, and I don’t find it helpful to use the term free banking to address those issues.